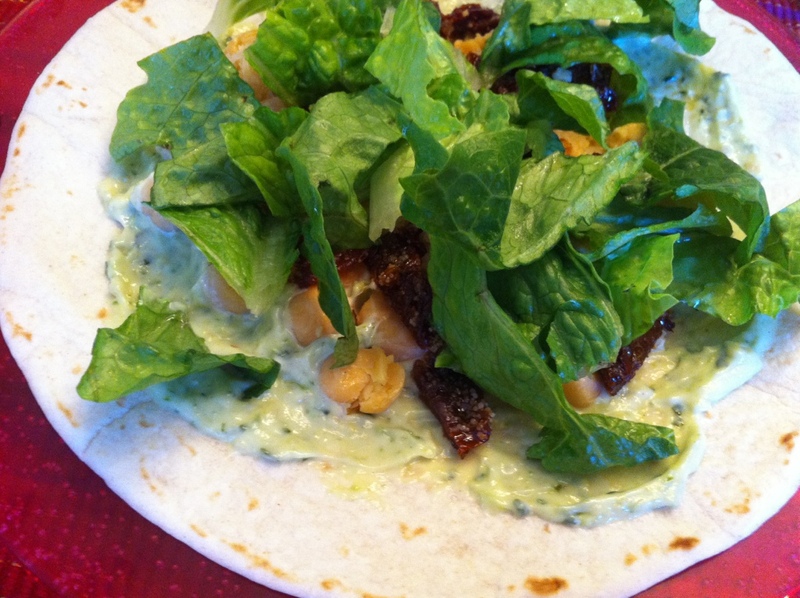 An easy way to jazz up a sandwich or wrap is with pesto mayo. It’s simple. Just mix pesto and mayo together to your desired consistency and go! 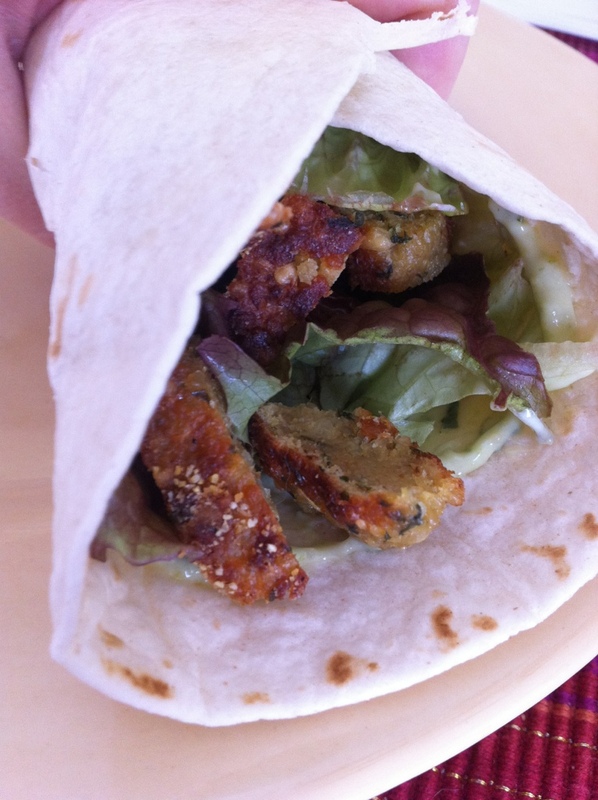 We have made a couple of really delicious wraps lately with pesto mayo. The first was chickpeas and sundried tomatoes. Spread pesto mayo on a tortilla. Top with chickpeas and slightly mash with a fork (to keep them from rolling out). Then add sliced sun-dried tomatoes and lettuce or spinach. It’s a little hard to see in the picture below but the mayo and the chickpeas are under there I promise. Just roll it up and eat! The second was sliced quinoa bites and sundried tomatoes. Again, spread pesto mayo on a tortilla. 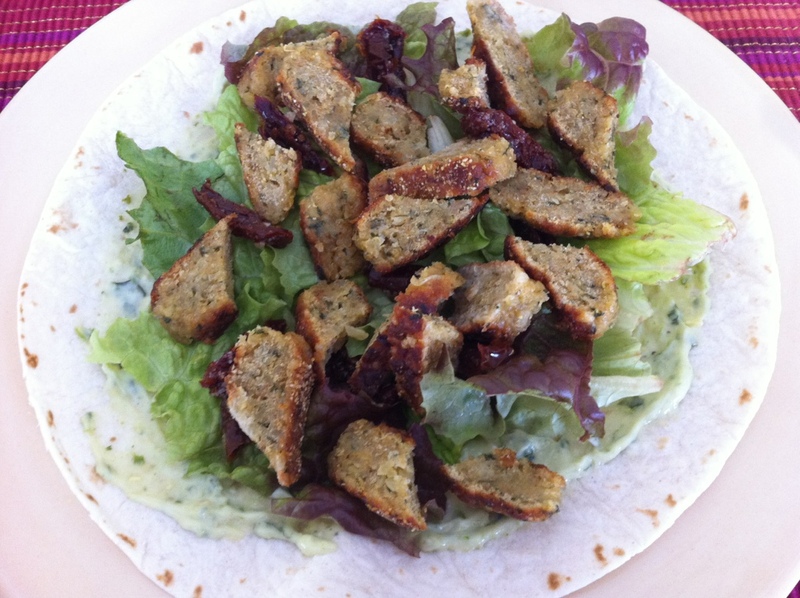 Top with lettuce, sliced sun-dried tomatoes and sliced quinoa bites. Quinoa bites are a great substitute for chicken. We keep a bag of them in our freezer so we can pull out a few whenever we want for lunches or a quick dinner. Pesto mayo is also delicious on grilled cheese or any other grilled sandwich or panini. I never actually measure anything when I make it but if I had to guess the ratio I would say 2/3 mayo to 1/3 pesto. You can use prepared pesto or make your own. Now that I am trying to eat less processed food, I’ll have to whip up some homemade mayo when we run out of store bought. I’m not comfortable using raw egg but I have seen a few versions on the web that omit the egg. Always excited to try something new!